High on my list of favorite treats are tart, crisp apples, especially green apples. 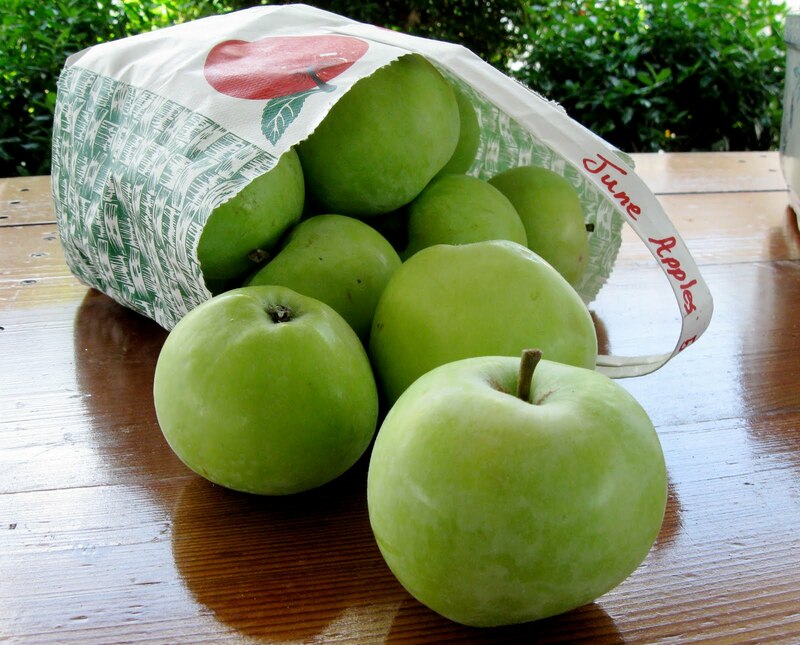 During a recent trip to Kentucky, bags of green apples caught my attention at a produce market we visited in a local Mennonite community. The smallish apples were clearly not the Granny Smiths that sometimes fail the tart-and-crisp test in our hometown food stores. But were these Kentucky apples really tart and crisp? I asked one of the Mennonite gentlemen working there that question. He ventured no comment but placed one of the apples on some boxes he was moving. “You can try it if you want to,” he said. I did; the apple passed the test; and I closed the deal. I departed munching my sample and carrying a $5 bag of apples. We are back in Mississippi now, and several days ago I shared apples with my mother, a fellow green-apple addict. In fact, she takes credit, whether through genes or by example, for my love of edibles tart and sour. As a child, two of my best-loved family anecdotes were about her appetite for green apples. Her love of green apples was already well established at a young age. Green apples were abundant on a gnarled old tree on the farm where her family lived during her early childhood. Her father, however, had laid down the law: no picking apples before they were ripe. He underestimated his number five child's determination and creativity. She and her younger sister climbed up the sloping trunk of the apple tree. With feet firmly planted on the nearly horizontal trunk, they held onto a limb above them and inched out toward the prize dangling before them—green apples. They ate their fill, leaving a limb full of dangling apple cores still attached to the tree. Their father, a fair man, decided he could not mete out punishment since they had not actually picked the apples. He did, however, cover all his bases with the assurance that punishment would be swift and unpleasant if they failed to obey the spirit as well as the letter of his edict in the future. Years later, when she was pregnant with me, she and my father lived in a small travel trailer in a pecan orchard while he attended Mississippi State University on the G.I. Bill. Even though they were frugal with their meager income, she splurged almost daily to fulfill a craving for green apples. She would purchase three for 10 cents from a produce man who made his rounds among the GIs and their wives. Then she would immediately proceed to munch her way through all three, savoring the tart, crisp bursts of flavor. With that family history, how could I not love green apples?